Slippery, slathery, sparkly soap. We squirt a dollop on our hands, rub it in timed to the birthday song, rinse off, and our hands are squeaky clean. But what is soap, and why does it work? Soaps first appeared in recorded history several thousand years ago, and undoubtedly, the substance was around for some time before that. 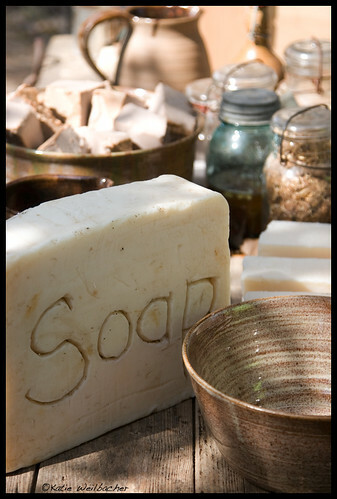 These early soaps were rendered from ashes and animal fats, and creating soap was a household chore. Eventually, in the seventh century in Europe, artisans took on the task of producing it, and later still in the 18th century, the industrial production of soap began. When used for cleaning, soap acts as a surfactant in conjunction with water. Soap cleans thanks to micelles, tiny spheres coated on the outside with polar hydrophilic (water loving) groups, which create a lipophilic (fat loving) pocket around the grease particles, which disperses the grease in the water. The lipophilic portion is made up of the long hydrocarbon chain from the fatty acid. Though normally oil and water do not mix, the addition of soap allows oils to disperse in water and be rinsed away. Synthetic detergents operate by similar mechanisms to soap. The fall release of the weekly, online, video series “Chemistry Now” is under way, and we’re starting with surfactants (soap, detergent) as a source of interesting video and lessons. As we’ve written before, please view the video, try the lessons, and let us know what you think. Video: The video “It’s a Wash: The Chemistry of Soap” explains how soap and detergents — surfactants — affect the surface tension of H2O to break up dirt, especially greasy dirt. We also profile 21st Century Chemist Facundo Fernandez at Georgia Tech, who uses chemistry to detect dangerous or ineffective fake pharmaceutical drugs and medicines. Middle school lesson: In Mixing the Immiscible, students observe the interaction of immiscible liquids by designing an experiment to test the action of surfactants. They compare the results of adding various surfactants to a mixture of immiscible liquids, use their data and observations to discuss why some liquids are immiscible in other liquids, and come to understand how surfactants work. High school lesson: In Getting Clean, students observe the interaction of immiscible liquids, compare the results of adding various surfactants to a mixture of immiscible liquids, and explore how soaps clean. This entry was posted in Videos and Lessons and tagged detergent, lesson plan, soap. Bookmark the permalink. Trackbacks are closed, but you can post a comment.